The rainy season is finally here, and that might give some people the blues, but don’t despair: This is actually one of the best times in Okinawa to experience the “great blues” of hydrangeas, native flowering plants whose “beauty in blue” is unique to this time of the year. One could describe the color that greets visitors to the Yohena Hydrangea Garden as a riot of hydrangea blue. This privately owned garden was started by a woman named Uto Yohena 30 years ago. She kept planting the flowers little by little every year, and what initially began as a hobby has now blossomed into an ocean of hydrangeas that locals and tourists love to visit. The garden is carpeted in a rare, pale blue complimented by the more intense shades of the hydrangeas. 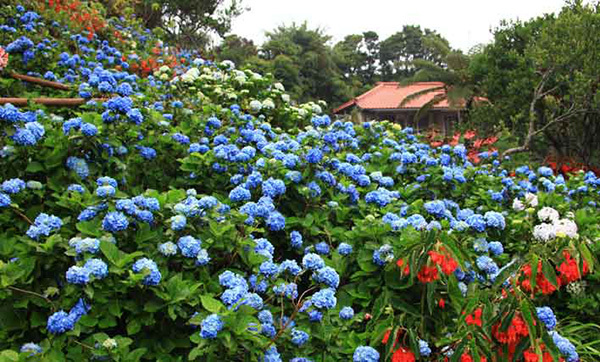 “The onset of the rainy season heralded the start of the hydrangeas blooming. We will open the garden on Saturday, May 17, this year. The hydrangeas will be in their half-bloom phase by then. There are also other flowers to see, so come and have the first look at their rainy season ‘blues blossoming’,” says the owner of the garden, Ms. Yohena. As the garden is privately owned, there are no set hours of operation. This year the garden is open from Saturday, May 17, to early July, allowing visitors to see the flowers until sunset.